﻿ Cristiano Ronaldo: "We have to keep playing every game as if it was a final"
13.02.2012 » Cristiano Ronaldo: "We have to keep playing every game as a final"
He's the man of the moment, after scoring another impressive and decisive hat-trick that allowed Real Madrid to beat Levante by 4-2. When speaking to the journalists last Sunday, Cristiano Ronaldo said that Real Madrid won't underestimate Barcelona now that they are 10 points below and that he is very happy for the Santiago Bernabéu fans to have chanted his name in their last game. After scoring his 6th hat-trick of the season and reaching the 27th goal in La Liga 2011/2012, Cristiano Ronaldo had a quick chat with a few journalists, right after the game against Levante. The Real Madrid player assured that his team will keep focused in the remaining games of the Spanish League and that the 10 points lead over Barcelona are important but not yet decisive. Real Madrid will now take Racing Santander next Saturday, in another La Liga fixture to be held at the Santiago Bernabéu. Next week, the Merengues are set to return to the UEFA Champions League, as they will travel to Russia for the last-16 1st leg clash, against CSKA Moskow. The Portuguese forward started by giving voice to his analysis of this Sunday's game. Cristiano Ronaldo: "We didn't start the game in the best possible way and due to that, we suffered an early goal. However, we reacted very well and the entire team responded properly. We won the game and that was the main goal we had set before the match. It was important to get the victory because we were aware of the possibility of extending the lead over Barcelona to a 10 points difference, so we can say now that our objective has been accomplished." One of the highlights of the night has been Cristiano Ronaldo's 3rd goal, not only because of its inherent beauty, but also due to its great symbolic significance, since it was Real Madrid's 4000th goal in La Liga, at the Santiago Bernabéu. Cristiano Ronaldo: "Indeed, I scored the 4000th goal, but the reason why it has been important is because it helped the team, so I'm very happy for having scored it", noted CR7, remarking the importance of his actions as long as it helps his team reaching their objectives. Many people doesn't believe that Real Madrid will waste a 10 point advantage over Barcelona, even though there are still 16 games to be played. However, Cristiano Ronaldo prefers to be cautious on this matter and assured that his team won't neglect their opponents from now on. When asked to comment about the 10 points gap, this was Ronaldo reaction: "I'm not convinced... There are still many games left in La Liga. We have to keep going this way, because we know everything can change all of a sudden...", replied the Portuguese player. Cristiano Ronaldo: "We're following our own path and we'll stay focused at all the remaining matches. We're treating every game as if it was a final, so we don't care about what others may say about us. We're doing well, we're confident in ourselves and we'll keep doing our thing in the 16 games that are left in La Liga." Cristiano Ronaldo relationship with the Santiago Bernabéu crowd has met its worst days in the beginning of 2012, after the Portuguese player got whistled in several occasions, during Real Madrid home games. However and as we reported a few days ago, it all seems to have been sorted over the last weeks and this last Sunday, Cristiano Ronaldo's name ended up by being chanted out loud by the Santiago Bernabéu crowd. Cristiano Ronaldo: "The truth is that I'm very happy, because it was something I was hoping to see for a long time. I'm really happy for the fans to chant my name, as not only it is a great honor to me, but also to the entire team. Therefore, I'm very thankful for the support our fans keep giving me and the team, because we'll only win important things if we keep strong and united", commented CR7. There was still time for Ronaldo to answer the journalists curiosity regarding the celebrations occurred after the Portuguese star scored his hat-trick against Levante. Cristiano Ronaldo: "I just decided to go to our bench to celebrate the goal with José Mourinho, the other staff members and my teammates. We were struggling a bit and that was a pure moment of joy, since it has also been a beautiful goal. 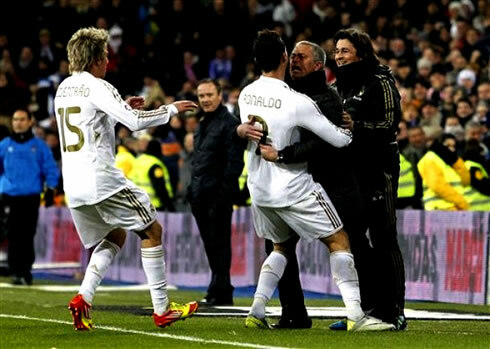 There is no special or hidden meaning in the way we celebrated that goal", replied Ronaldo, denying the media suggestions that the hug given to José Mourinho could imply something different than a "normal" celebration. Real Madrid next game will be against Racing Santander for La Liga, next Saturday (18-02-2012). In the meanwhile, you can watch AC Milan vs Arsenal free, but also Bayer Leverkusen vs Barcelona live and Lyon vs Apoel Nicosia online for the UEFA Champions League, from our football live streams section. Cristiano Ronaldo is expected to be on the line-up against Racing, in the next weekend fixture.